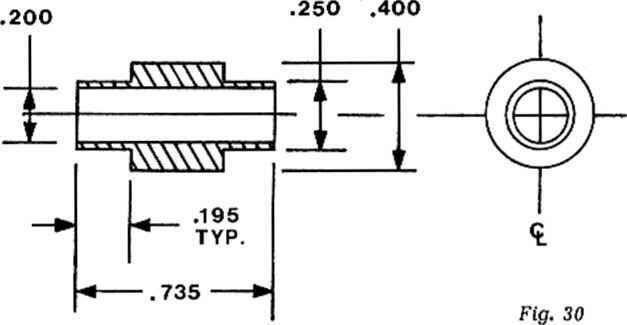 In the cocked position, the sear is under forward pressure against the lower notch in the hammer by means of the pressure pin and spring contained in the sear. During cycling of the bolt at the position in which the hammer pivots forward, the semi-auto notch engaging the nose of the sear, the sear assembly is pushed backwards overcoming the forward tension exerted by the compression pin and spring. This short longitudinal movement of the sear places the rear of the sear above the upper step of the trigger block. The complete forward movement of the bolt and carrier assembly depresses the release lever which in turn forces the catch (secondary sear) forward out of an intersecting position with the hammer. At this point the hammer is retained only by the sear. 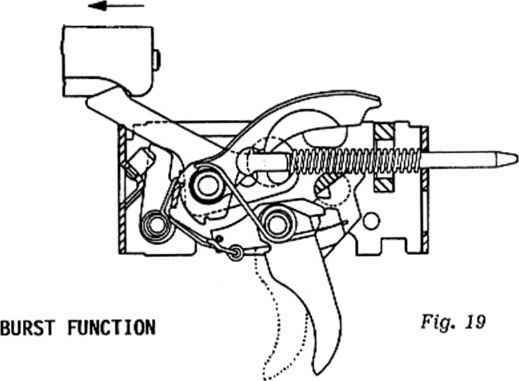 When the trigger is depressed the extending lever ■with its machined groove rotate upward against the selector lever shaft which is in the "F" position. At the same time the sear nose is pivoting downward out of engagement with the hammer, thereby releasing it to rotate forward under pressure from the pressure spring. The hammer having been released from engagement with the sear rotates forward hitting the firing pin and detonating the cartridge. 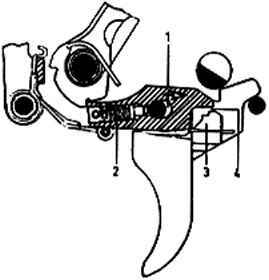 As the hammer rotated forward the rearwarxi pressure against the sear was released, allowing the pressure pin and spring in the sear to push the sear assembly forward. With the trigger still rearward the forward pressure against the sear causes the rear of the sear to slide off of the top of the trigger block into a recessed notch. At the same time upward pressure is exerted on the bottom of the sear nose by the torsion spring and roller contacting the base of the sear. As the bullet exits the barrel, the bolt carrier assembly reciprocates pushing the hammer backwards. As the hammer continues rearward rotation the semi notch will engage the nose of the sear momentarily which is under pressure from the torsion spring. As the hammer continues movment rearward the burst notch in U\e hammer slides over the engaging surface of the secondary sear which is also under tension from the torsion spring. The recoiiing bolt earner assembly strikes the buffer and under the influence of the recoil spring reverses causing forward movement of the bolt carrier assembly. The camming surface in the bolt carrier forces the release lever forward in turn puliingr the secondary sear out of engagement with the burst notch in the hammer. At this point the hammer cannot be released until the firer releases the trigger which allows the rear of the sear to rise above the top of the trigger block at which time the pressure pin and spring in the sear move the sear rearward over the trigger block. The sear can then be pivoted out of engagement with the hammer by depressing the trigger again. The process of single shots will continue as long as the firer manually initiates them. For full automatic firing the selector lever is turned to "A" which positions the slot in the selector lever shank in such a manner as to allow maximum travel of the trigger and extended trigger arm against the selector shaft. 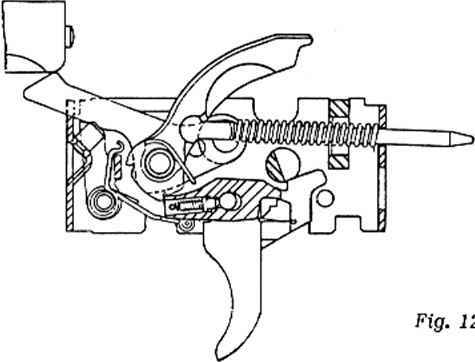 The extended travel of the trigger in this selector position forces the sear nose to be positioned in such a low location as to prevent the interception of the hammer by the sear nose. The hammer is held only by the secondary sear in the burst notch. After the initial release of the hammer by pulling the trigger when the weapon is in a locked and loaded position, each cycle of the bolt carrier assembly causes the hammer to engage the secondary sear during rearward movement and subsequently releasing the hammer upon forward movement as the bolt carrier engages the release lever tripping the secondary sear out of engagement with the hammer. 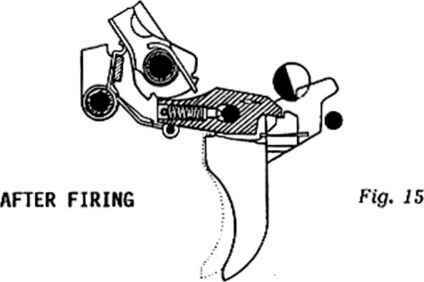 The firing sequence can be interrupted by the firer by simply releasing the trigger which allows the sear nose to intercept and hold the hammer in a cocked position. 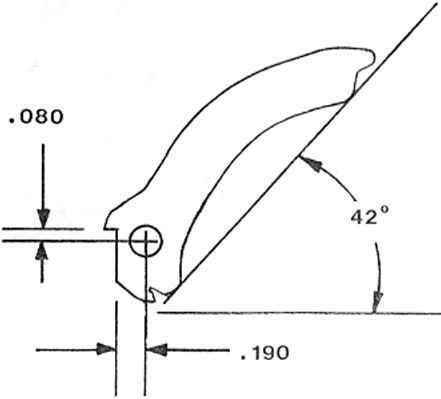 90° wheel will provide the correct profile notch in the hammer. 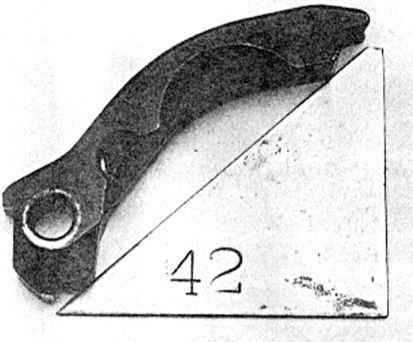 Note the location of the step in relation to the pivot hole in drawing # 23. The bolt carrier used in the HK-94 was originally machined to be an MP5 carrier. The MP5 carrier provided a camming surface in the right hand clearance slot milled in the bottom rear area and is used to contact and trip the top of the release lever during the final forward movement of the carrier and bolt assembly. This in turn disengages the secondary sear from the hammer and as long as the trigger is pulled, effects full automatic firing. This action occurs each time the weapon cycles, regardless of whether it is in the full or semi-automatic mode. In the HK-94, this camming surface has been removed by milling the clearance slot all the way to the rear of the bolt carrier, thereby removing the capability to trip a sear release lever. In doing this conversion, it was necessary to make a tripping block which was heli-arc welded in the slot. The profile of the block provides a radiused camming surface identical to the original MP5. An alternate method of attaching the tripping block to the bolt carrier is to bond the block onto the bolt carrier using a high strength epoxy cement such as "J-B WELD", which is an automotive epoxy used to repair engine blocks. This product is available at many automotive supply companies. 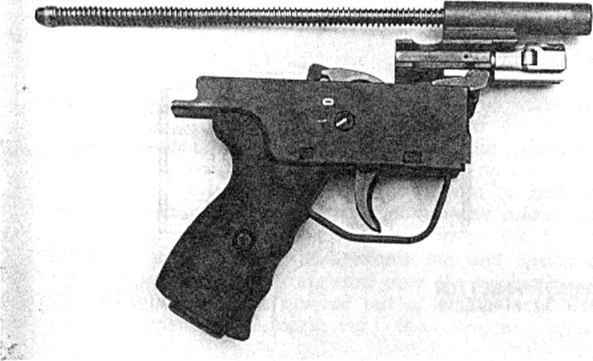 The trigger housing is another part which was originally made for the MP5, but later modified for the HK-94. The trigger travel limit pin must be removed to allow further trigger travel, necessary when the selector is in the full automatic position. 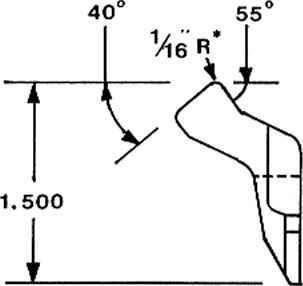 In this position the sear nose, which engages the hammer sear notch (primary), can be pivoted into a lower positon where it cannot intercept the hammer until the trigger is released. Also, the double-arm torsion spring roller, which pushes the sear upward, has a different pivot spindle hole location, closer to the hammer than that found on the MP5. 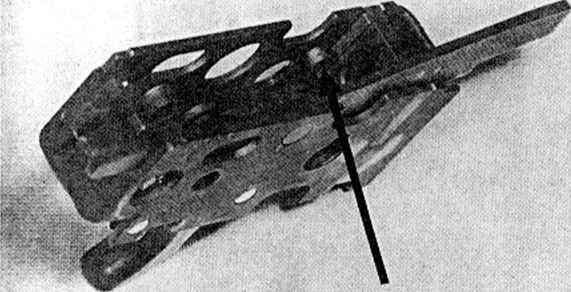 This is because the lower front housing was altered to provide clearance for the block in the matching area of the grip which mounts into the receiver. A clearance slot must be milled into the small bottom plate of the trigger housing. This allows clearance for the release lever assembly when it pivots forward. To remove the trigger travel limit pin for this conversion, either mill the protruding part of the pin down flush with the inside surface of the trigger housing, or use a hand grinder such as a DREMEL "MQTO-TOOL" to remove the pin. The "grip" is the external housing into which the trigger housing is assembled. The 94 grip features two settings for positioning the selector. The upper detent is labeled "S" or "0", and represents SAFE. The lower detent is identified as "F" or "1", and represents FIRE (semi). 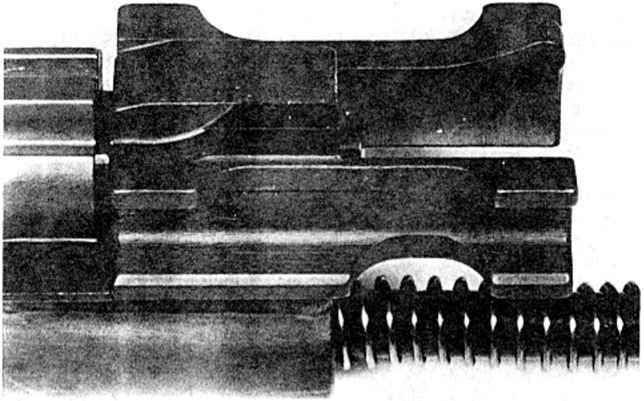 Since a third detent is required to position the selector for full-auto firing, the selector lever stop lug which acts to stop rotation of the selector downward, must be pressed down flush with the surface of the grip and a third detent be machined or pressed into the grip to position the selector in the "A" or "2" setting, representing FULL AUTO. 1. Insert a tightly fitting block in the grip frame under the stop lug. 2. Place a narrow shim made from feeler gage or shim stock thick enough to fill the space between the block and the .bottom of the raised part of the grip which has the detent pressed into it. The purpose of this thin shim is to support the raised part of the grip when the lug is pressed. 3. Press the stop lug down until it is flush with the top of the raised area of the grip. Finish touching up the remaining surface irregularities here by smooth filing and filling any remaining depression with a filler material. Touch-up paint with a semi-gloss black paint. 4. Locate the position of the third detent and indent the grip by either pressing or machining with a .125 diameter ball nosed end mill. The latter method is the one most commonly used and easiest to perform. Commercial HScK 94 specifications below. Close-up detail of the completed modification to Bolt Carrier showing Tripping Block in position. Spring clearance notches 3/16" long X 1/8" wide, two places. 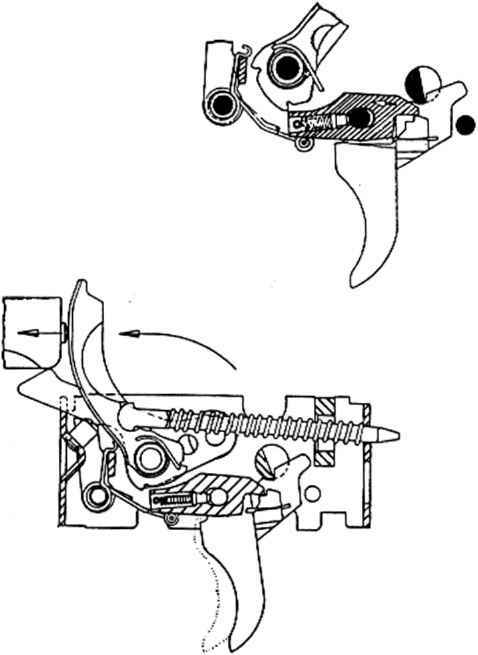 The parts to be manufactured to complete selective fire conversion of the HK-94 consist of the TRIPPING BLOCK and the SECONDARY SEAR/RELEASE LEVER ASSEMBLY. As previously described in the chapter MODIFICATIONS TO WEAPON under "BOLT CARRIER", the bolt carrier must be modified to provide a contact surface which will engage the release lever. This is accomplished by constructing and installing a Tripping Block, which simulates the original profile of the contact area on the bottom of the bolt carrier. The block can be constructed of almost any type of steel, with heat treatable types being the most desirable because of their wear resistant characteristics. 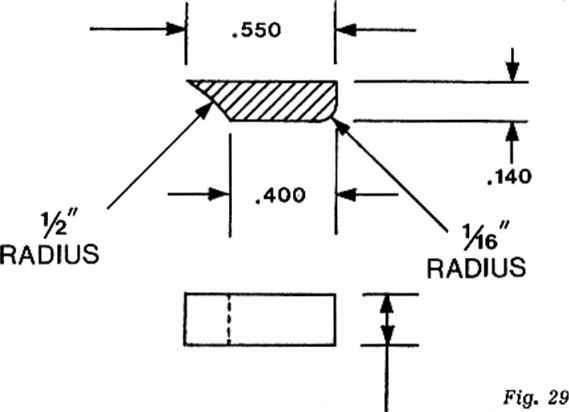 A material such as unhardened, ground tool steel (for example-STARRETT 0-1 or A-2) can be easily formed, and then hardened after it is in its finished configuration. This will allow continuous use without excessive wear between the contact surfaces. This assembly consists of three individual components: the spindle, a secondary sear, and the release lever which are assembled by heli-arc (TIG) welding. The conversion procedure centers around this assembly which replaces the torsion spring spindle 1n the trigger housing. 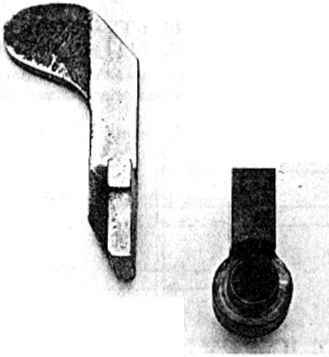 The function of this part is to hold the hammer "cocked" during automatic functioning when the primary sear is in the low position where it does not intercept the hammer during the cyclic action of the bolt and carrier assembly. The release lever is the part which, when contacted by the tripping block mounted in the bolt carrier, pivots forward releasing the hammer to rotate forward and strike the firing pin. Construction of this part has been made simplified as much as possible to eliminate difficulty in building it. This method entails building component parts, and then assembling them by welding. This method is relatively easy when compared to building the entire part from one piece of steel. The following identifies and describes each component part. The builder may choose to make a new spindle duplicating the one from the weapon, order a replacement spindle from H&K, or simply use the spindle which was removed from the trigger. The secondary sear is the part which contacts and engages the locking notch in the hammer. 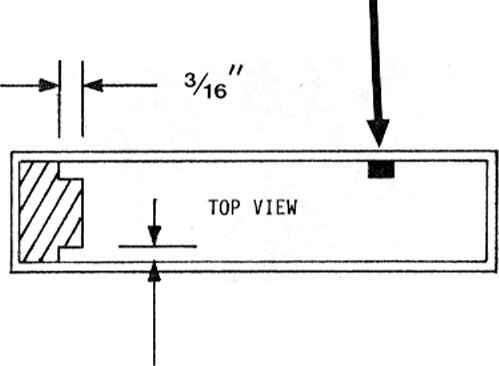 This block should be constructed of a heat treatable steel, equivalent to the material used for construction of the tripping block in the bolt carrier modification. Machine this part as shown in drawing #32. It will first be assembled to the spindle by welding the two together. Make sure that the two are held parallel when welding. An alternative to he!i-arc welding is to silver solder the two parts together. If the builder has the facilities to do so, the engagement surfaces of the secondary sear, (top and side facing hammer) can be left about .010-.015 oversize and then after assembly to the spindle the engagement surfaces may be precision ground to the dimensions given. This operation will ensure a precision, parallel engagement with the notch in the hammer, although it is not absolutely necessary to ensure proper functioning. This is the final component of the SECONDARY SEAR/RELEASE LEVER ASSEMBLY. This part, when assembled with the spindle and secondary sear, functions as a lever which is contacted by the tripping block in the bolt carrier during each cycle of the bolt and carrier assembly. The forward movement of this lever subsequently trips the secondary sear out of engagement with the hammer. This part can be made several ways, including forming flat steel on a forming brake, forming flat steel stock by heating and hand forging in a heavy vise, or as performed in this conversion, machine the lever from a piece of structural grade angle iron. The size used to build this part was 1" X 1" X .125 thick. This material is easily aquired and shows a surprisingly good wear resistance in this application since the amount of pressure on the contact area of the lever is not that great considering the pivot point of the assembly and angle of di sengagement. After welding the component parts of the complete assembly, you may harden the secondary sear to improve its wear resistance. If the material used for construction is an oil or air hardening tool steel such as 0-1 (oil hardening) or A-2 (air hardening), heat the secondary sear contact area with a torch until it is cherry red. If 0-1 is used, quickly quench the entire part in quenching oil until it has cooled completely. Heavy-medium oil may be used if regular heat treat oil is not available. If the material is A-2, simply allow the part to air cool completely. The grinding operation can be performed at this time if desired. After installing the new and modified parts, test for proper functioning by hand cycling the action. You will be able to look through the magazine well and observe the release lever contact the camming surface of the bolt. Make sure the bolt and carrier slams home and that the locking rollers engage. In the safe and semi-automatic modes, the function is the same as before modification. When the select lever is placed in the lowest position, full automatic fire is obtained. 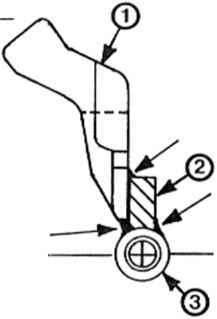 The trigger is able to travel further rearward, moving the primary sear fully away from the hammer sear notch. The secondary sear of the release lever assembly now takes over and holds the hammer until the bolt is in battery. This cyclic action continues until the magazine is empty or the trigger is released, allowing the primary sear to take over. If the trigger is depressed again, automatic fire will continue. This conversion is performed in the same manner as that which is applied to the HK-91/93. All of these weapons function in exactly the same manner, however, the HK-94 release lever and tripping block have a different profile than those used in the 91 and 93. USE THIS AS A TEMPLATE FOR LAYING OUT THE RELEASE LEVER. 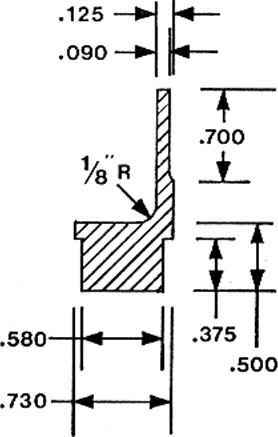 MATERIAL FOR CONSTRUCTION IS STRUCTURAL ANGLE, l.OO" X 1.00" X .125. * BUILDER MAY CHOOSE TO LEAVE THE CONTACT AREA OF THE LEVER LARGER, ALTERNATELY INSTALLING, TESTING, AND FITTING AS NECESSARY. What is needed to make hk94 full auto? How to modify full auto sear into semi config? Is recoil buffer necessary on hk94? What is primary and secondary sear angle? How is the hammer and trigger being positioned? How to build a hammer and trigger of sniper no need machine?